In the past, when we plan a build environment updates, we wrote a brief blog post announcing upcoming changes. Unfortunately, the reach of these announcements was rather narrow, and users were often caught by surprise when their builds started failing suddenly. 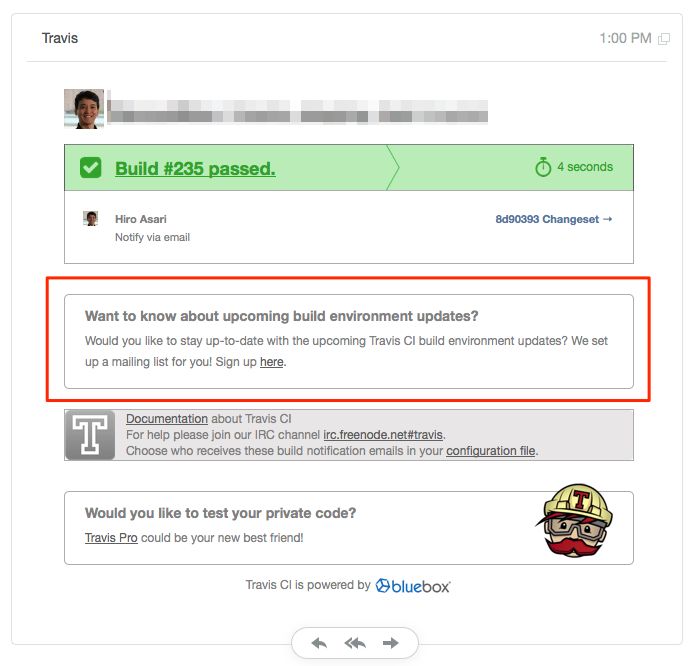 We are going to change the process, starting the next update scheduled next week (December 9 for travis-ci.org, December 11 for travis-ci.com). There will be no more blog post announcing the udpate after this one. These tend to clutter our blog. Going forward, separate documents will chronicle build environment updates. We have created an Atom feed to which you can subscribe in order to keep abreast of these updates. We have set up a mailing list to announce the updates, and you can sign up now! As mentioned above, the next update is scheduled next week. You can find the details here. We hope that these changes will make our build environment updates more transparent.